Last week Panorama highlighted the crisis in social care, whereby domiciliary care companies have had to hand back contracts with local authorities, due to a lack of funding. This has been an ongoing situation for some time, and also affects care homes who have local authority beds. The programme also highlighted ‘bed blocking’, whereby patients have to spend longer in hospital as there is a shortage of carers available to help them at home. 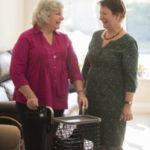 Live-in care is often overlooked as a practical alternative. It can also be very helpful to have a carer there around the clock for a while. We welcome enquiries from those currently in hospital, who are medically fit to return home, but do not have the care set up to do so. Discuss your care needs on 01892-512961.